Flick Kick Chelsea joins Angry Birds, Cut the Rope and a handful of Apps that belong in the most addictive games category. PikPok took its critically acclaimed Flick Kick Football title and wrapped it within a Chelsea skin, complete with facts and a detailed history of the popular football club. The result is a must play and highly addictive experience that'll have you scoring goals for weeks, if not months from now. Instead of creating a full-fledged soccer/football game, the developers focused on the sport's most exciting aspect: nailing goals. Lots of them. Here, the object is to put the ball in the net at all costs, even if it means angling it around cardboard defenders and goalies. It's as simple as putting a finger on the screen and swiping upwards, then adding a little something extra while the ball's in flight, watching it ricochet off a post to score the point. It's easy to achieve and immensely satisfying. In addition, Flick Kick has a plethora of exciting modes that put unique spins on the phenomenal gameplay. Arcade tasks you with achieving as many goals as possible before time expires; each new goal adds precious seconds to the clock. That's cool, but we're even bigger fans of Bullseye, a mode that tasks you with hitting targets to score points. It sort of reminds us of the mini game in Kinect Sports for Xbox 360, but without the threat of injury. Bottom line, those modes will keep you busy for a long time, and there's still Time Attack and Skillshot to conquer. The biggest feature, though, is online multiplayer. Here, you square off against other players from around the world via Game Center. Jumping into a match takes a couple of minutes, and from there, you can enjoy a steady stream of opponents that'll test your swiping skills. Conversely, you can also play these modes locally, and if no one's around, take turns by sending shots back and forth. Of course, since the App supports Game Center/OpenFeint, you can expect both achievements and leaderboards. The only thing that bugs us (the only thing), involves the occasional pause that results in a wild kick, where the game responds to our attempt a half second too late. 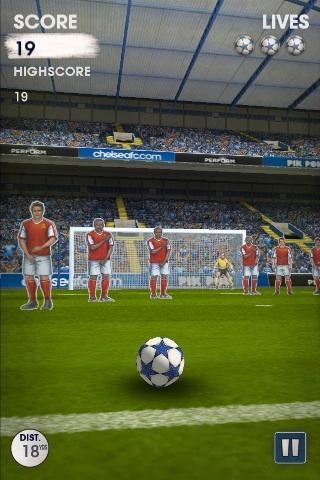 Otherwise, Flick Kick Chelsea offers an excellent football experience for the ridiculously low price of $0.99. Whether or not you should purchase it, of course, depends on your love for Chelsea. If you can't stand the club, stick with the equally impressive original. What's Hot: Tons of modes, user-friendly controls, Chelsea history and trivia, online and local play, sharp graphics, universal support. What's Not: Occasional performance hitch.